When you think of crockpot recipes, your mind probably goes right to things like stew, braised meats, or soups. I’ve seen plenty of dessert recipes for the slow cooker, but I’ve never tried to make anything sweet in mine. When I stumbled upon this recipe for triple chocolate brownies, I wanted to give my crockpot a whirl at making a dessert that sounded decadent and delicious. I figured these crockpot brownies were the perfect recipe to break my slow cooker in to the sweeter side of life. A few modifications from the original recipe – the cook time of 3.5 hours before cooking an additional half hour with the lid off was WAY too much cook time. The brownies that were around the edges burned and so did the bottoms of some of the other ones. I reduced the cook time and also added in a step to line not just the bottom but the sides with foil before adding the parchment paper to help prevent burning. Every slow cooker is different and the low setting on mine tends to be quite hot. If you find yours runs low, you might want to cook the brownies for the full 3.5 hours before removing the cover. It can be hard to know so you may have to just guess based on how it’s cooked other recipes and use trial and error. You can always err on cooking them more but keeping an eye on the slow cooker to see if you smell burning. Even if you cook for the 3.5 hours, the original recipe does note that the center may still look undercooked but it will solidify after cooling so do not be alarmed. Line the bottom and sides of a 5-quart slow cooker insert with aluminum foil and lightly spray with nonstick cooking spray. Line the bottom with a piece of parchment paper and again lightly spray with nonstick cooking spray. In a small bowl, whisk together flour, cocoa powder, baking powder, salt and espresso powder. In a microwave safe large bowl, add the butter and chopped bittersweet chocolate and heat in 30 second increments until everything is melted. Add the sugar and stir to combine; add in the beaten eggs and stir. Stir in flour mixture and chocolate chips and combine only until just moistened – try not to overmix. Transfer to the slow cooker and smooth the top with a spatula. Cover and cook on low for 2 ½ hours. Uncover and cook an additional 30 minutes (still on low). Remove the crockpot insert, run a knife around the edges to loosen the brownies, and let the insert cool on a wire rack for about 2 hours. Remove the brownies from the slow cooker and cut into pieces. 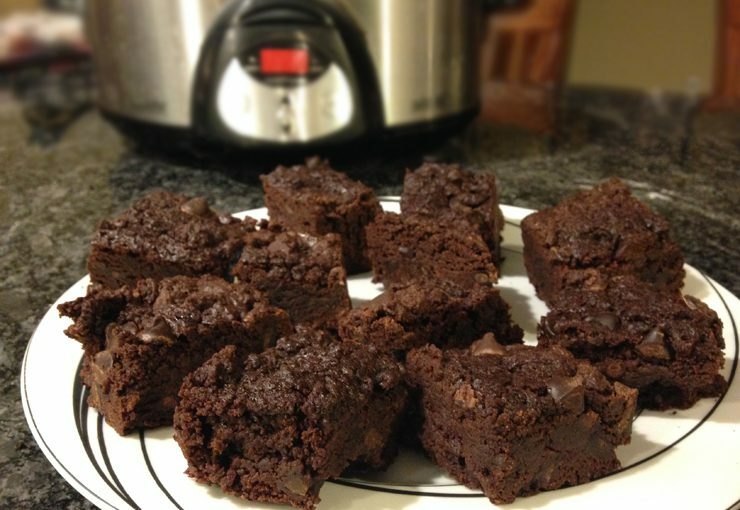 Hope this recipe for crockpot brownies expanded your thinking when it comes to the slow cooker! They’re wonderful for stews, but they can make a mean dessert, too.